South Africa has always been known for its exceptional wildlife and beautiful metropolitan cities like Cape Town; this luxury 12-day itinerary highlights offers all of that and so much more. Take an enthralling journey through South Africa, playing at some of the country’s most renowned golf courses and staying in some of Kruger National Parks exceptional safari lodges. Your journey begins with two nights at the infamous Sun City. Here you have the opportunity to explore the resort with ample leisure time to engage in whichever activities you desire. Or, simply spend the afternoon relaxing by the pool. Of course the focus of this tour is golf and a stay at Sun City wouldn’t be complete without teeing off at the Gary Player Country Clubs Championship Course. Designed by the ‘Black Knight’, Gary Player, this 18-hole par-72 walking course has hosted some of the world’s greatest golfing legends, and being home of the annual Nedbank Golf Challenge, the course continues to welcome world class golfers each year. After two nights in Sun City, you’re on your way to Kruger National Park where you’ll be staying at Lukimbi Safari Lodge for the next three nights. Spend the next couple of days exploring the African wilderness on morning and afternoon game drives and playing the exciting 18-hole course at Leopard Creek Country Club. The Leopard Creek golf course offers golfers a truly remarkable experience. With its innovative design and close proximity to the Kruger National Park, sightings of wildlife aren’t uncommon. You’ll find that many of the lakes and streams across the course are home to crocodiles, but you may also catch glimpses of hippo, antelope, buffalo and even elephant on the course itself. The course is world-renowned and hosts many tournaments across the golfing year, brining in golfers from all over the world. The adventure continues on to the gorgeous city of George, situated along the picturesque Garden Route. Here you’ve got two nights at The Fancourt Resort Hotel and Manor House. Spend your days exploring the stunning white beaches and the picturesque Outeniqua Mountains. You’ve also got the option of playing any of the resort’s three premier golf courses all within the Top 20 in South Africa. 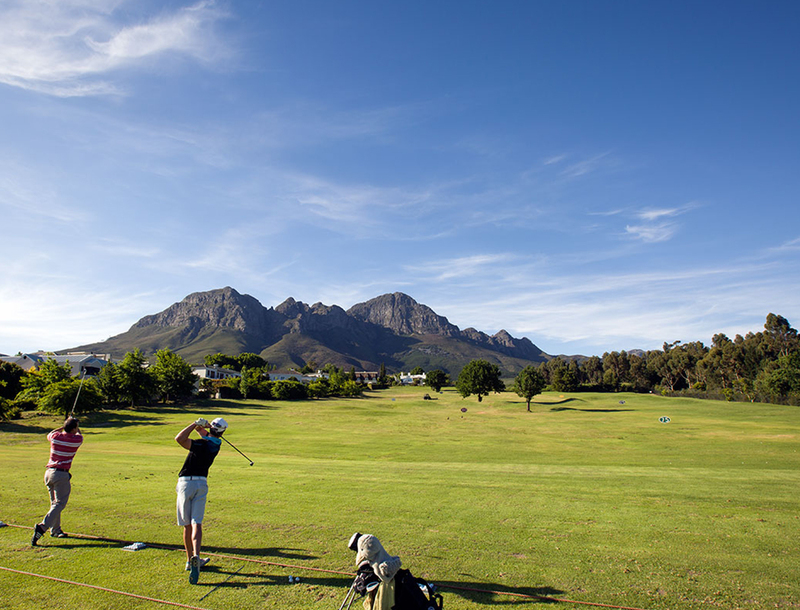 Legendary golfer, Gary Player, originally designed the 18-hole Montagu course. Picturesque, the tree lined course covers varied terrains across rolling land. Providing players with many challenges and hazards, the course is riveting. Offering a relaxed atmosphere, the Outeniqua course is much easier than Montagu. Once again designed by Gary Player, he named it after the mountain range backdrop of the same name. South Africa’s No.1 Golf Course, The Links is part of the private Club of the same name and its use is exclusive to members. However, as a guest of The Fancourt Resort Hotel and Manor House you too have access to this prestigious course. Transformed from an airfield into an amazing piece of environmental and golfing heritage, The Links has hosted some of the most prestigious tournaments in the world, including the Presidents Cup (2003), the SA Open (2005) and the 2012 Volvo Golf Champions European Tour. Collaboratively designed by the iconic, Gary Player, course designer, Phil Jacobs and Fancourt owner, Dr Hasso Plattner; the 18-hole championship course draws inspiration from famous links courses of the British Isles. With the striking backdrop of the Helderberg and Hottentots Holland Mountains, Erinvale’s 18-hole course designed by Gary Player is an exciting course offering exceptional scenery throughout. The first nine holes take you through narrow fairways lined with gorgeous properties, complimenting the landscape and environment. The second nine lead beautifully to the foot of the Helderberg’s. As you near the end, enjoy rewarding sweeping views over False Bay, surrounding vineyards as well as the Helderberg Nature Reserve. This exceptional golfing itinerary is perfect for avid golfers and is a must do for those wanting to play on some of South Africa’s most famous courses that have been visited and played on by many golfing icons of the world.